A French naval task force is currently steaming down Africa’s east coast as part of an extended five month mission that will include South Africa, but only for a port visit. 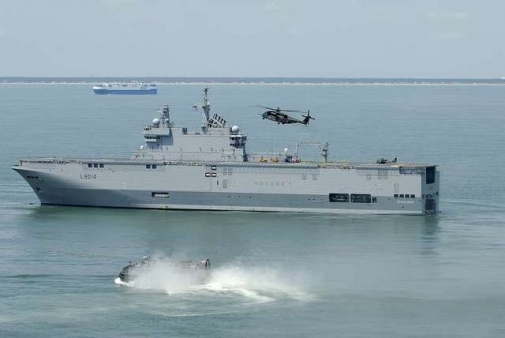 According to the French navy the deployment of the amphibious battle group will allow on-the-job training for young officer cadets to gain insight into the complexity of missions and operational theatres. The task force Jeanne d’Arc is built around landing helicopter dock (LHD) Tonnerre (Porte-Hélicoptères Amphibie – PHA) and frigate La Fayette (La Fayette-class frigate – FLF). The mission departed Toulon in France on 29 February and will return to the same French port in July. Its planned route takes the force through the Mediterranean Sea and the Suez Canal (Egypt), the Red Sea (Djibouti), the Indian Ocean via the Bab-el-Mandeb Strait and the Mozambique Channel (Mayotte, Madagascar), the Cape of Good Hope (South Africa), then the Atlantic Ocean (Brazil), approaches to Guyana, the Caribbean Sea (Martinique, Colombia), the Gulf of Mexico (Mexico), the Sargasso Sea and the Atlantic Ocean (United States, Azores), and finally, the Strait of Gibraltar and the Mediterranean. The French force will pay a courtesy visit at Navy fleet headquarters at Simon’s Town in mid-April. defenceWeb has reliably learnt there will not be any joint exercise with preparation for South Africa’s pending national and provincial elections in early May cited as a factor. The Jeanne d’Arc group will, as part of its overall tasking, conduct sovereignty missions including a patrol in the Mozambique Channel to reinforce a presence around Mayotte and the possibility of operations against illegal fishing. The channel patrol will ensure maritime sovereignty by integrating other French naval assets including French forces in the south of the Indian Ocean and maritime aircraft. Numerous co-operative activities are scheduled between the French Navy and the navies of major French partners Egypt, Brazil and the United States. According to a statement the activities “reflect the desire to maintain a high level of inter-operability with allies, as required to conduct operations in an international coalition”.